The desire to be engaged in purposeful, fulfilling activity is universal. Maslow classified it as a basic need in his “self actualization” rung of the pyramid. Aristotle called it eudemonia, or human flourishing: “the soul acting in accordance with virtue.” Csikszentmihalyi proffers two concepts: good work—in which one “enjoys doing [one’s] best while at the same time contributing to something beyond [one]self”— and growth toward complexity—in which people flourish as their achievements grow. When we boil all these concepts down, we see that they are all derivations of the same basic principle—what I call Live.Learn.GrowTM These three words tap into a universal truth that people ultimately want to be and do their best. So what does it take for this to happen? Well, for starters a company has to realize that what they do doesn’t really matter. Sound completely nuts? It shouldn’t. Think about companies that completely changed course or shifted strategy and direction. When a company that specialized in producing computers saw an opportunity in mobile phones, they introduced the world to the iPhone. When a video dating site called TuneInHookUp flailed, its founders decided to change direction and then created YouTube. An unsuccessful podcasting start-up worked on a side project for months before making it their full-time gig and renaming themselves Twitter. And more and more companies are seeing that making drastic shifts to what they do doesn’t have to impact who they are, as long as they are true to how they do it. Many companies modify strategy and approach and are unsuccessful because their compass is solely pointed towards profits vs the people who create them. So what goes into how a company does business and, more importantly, does it well? I believe it’s about creating an environment that allows people to thrive. Companies most often address this by defining their culture through a series of Core or Company Values. Take a sampling of some of the Core Values out there and you see many of the same themes repeated because, really, don’t most people want similar things? We want to work in a place where we feel respected. We want our clients taken care of, we want to do good work, our company to prosper. So why do so many of these attempt to create a strong culture through values fail? Values are often static and generic. In the effort to boil them down to universal truths, values are often universally useless. Many leaders and businesses try to create a list of values to impose upon the company, as opposed to creating a company with these values woven into the fibers of the business. They take the same approach with people; try to hire folks who have the skills they need and then try to instill the values in them once they are onboard rather than hiring people who, themselves, embody the values. I didn’t think about my business first, then try to create values to fit around it. Our values were actually one of the first things I had in place and soon it took shape as the Values SnowballTM, which is designed to sustain the Live.Learn.GrowTM culture. It is so important that values remain a dynamic element in an organization. Each value of the snowball builds upon the other both at the individual and organizational levels, gaining a momentum that snowballs and propels the growth and development of both. Additionally, the values are directly connected to the elements Live, Learnand Grow. The explicit connection of values to purpose reinforces the WHY our organization exists, which inevitably influences the HOW we do the WHAT. More on this, in future posts where I delve into each value in a bit more detail. A critical assumption behind this approach is that businesses leveraging our methodology would have to outperform their peers in the market. Profit is only the means to the end, but it is a powerful validator for those who would initially be dismissed as “unsustainable nice to haves”. In his book Conscious Capitalism, Whole Foods CEO John Mackey argues that profit maximization need not be the sole purpose of business and calls for “a way of thinking about business that is more conscious of its higher purpose, its impacts on the world, and the relationships it has with its various constituencies and stakeholders.” It is not that profits are not the responsibility of a business; without strong performance people lose their jobs, investors lose their money, and customers lose access to a product or service that is important to them. Instead, it is the blind pursuit of profits as purpose that leads companies astray. Sound too good to be true? Mackey and his co-founder tracked businesses who adhered to these practices over 15 years and compared their performance to the S&P 500. The result? 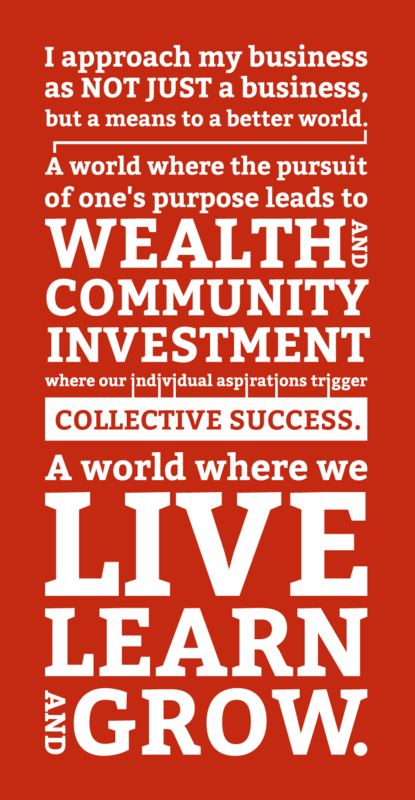 Businesses built on a higher purpose and values outperformed the market ten to one! I want to help create a world where everyone has the opportunity to live, learn and grow. Ultimately, that is what my company aspires to do daily for anyone we touch. While there are many ways to do this, I’m personally compelled to drive this change through the workplace. Since so much of the world spends so much time and energy at work, my assumption is that, by changing the way the world does business we can fundamentally change the world.